Kickoff of the college football season and the start of wheat planting are Labor Day traditions in the southern Great Plains. Many producers are waiting to see if rain forecasted for this weekend materializes, but it is likely that forage-based wheat farmers will start sowing wheat next week whether it rains or not. This means sowing wheat into hot soil conditions which can cause wheat germination and emergence issues. Given the potential problems, there are a few questions producers should ask themselves prior to planting into soil temperatures >90F. If the wheat coleoptile does not break the soil surface, the germinating wheat plant will not survive. Will you have to plant deep to reach moisture? That first structure protruding from a germinating wheat seed is actually not a leaf. It is the coleoptile. The wheat coleoptile is a rigid structure whose sole purpose is to “punch through” the soil surface so that the first true leaf emerges above the soil surface. If this does not happen, the first true leaf will try to extend below the soil surface, turn yellow, and take on an accordion-like appearance (picture above). Modern semi-dwarf wheat varieties have shorter coleoptiles than older, tall wheat varieties and coleoptile length is shortened even further by hot soil conditions. So it is important to plant a variety with a longer coleoptile length (e.g. Garrison or Doans) if planting deeply into hot soils. A rating of coleoptile lengths for wheat varieties can be found in OSU Fact Sheet 2141 OSU Wheat Variety Comparison Chart available at www.wheat.okstate.edu or at the direct link to the publication here. Is the variety high temperature germination sensitive? High temperature germination sensitivity is a fancy way of saying that some wheat varieties simply don’t germinate well in hot soil conditions (e.g. 2174, Overley). The extent of the sensitivity varies by year, so Overley might germinate fine in 95F soils one year and produce a 10% stand in the same soil conditions the next. When sowing early, it is best to plant varieties that do not have high temperature germination sensitivity (e.g. Duster, Gallagher, or Armour). Soil conditions generally cool due to lower ambient temperatures or cooling rains by about September 20; however our summer temperatures seem to be arriving late this year, so it is best to know the level of germination sensitivity in the variety you are planting. A rating of high temperature germination sensitivity for wheat varieties can be found in the variety comparison chart linked above. A more detailed explanation of the phenomenon can be found in OSU Fact Sheet PSS 2256 Factors affecting wheat germination and stand establishment in hot soils (available by clicking here). Should we plant by seeds per acre or pounds per acre? I will certainly not settle this issue in a single blog post, but I will provide ammunition for those in both camps in the discussion below. Before the discussion begins, I must come clean by acknowledging that when I came to Oklahoma ten years ago, I was solidly in the seeds per acre camp. As a crop consultant I spent most of October every year calibrating clients’ drills each time they changed varieties or field conditions changed. I was certainly not willing to entertain the notion that this could have been wasted time. After reading the published research on the subject, however, I have moved to the pounds per acre camp and will probably remain there unless seed prices increase dramatically OR seed quality improves significantly (I will elaborate below). The published research on wheat seed size clearly shows that larger seeds produce more vigorous plants which result in more and larger tillers per plant. Additionally, the research indicates that if you sow the same number of seed of both small and large seeds from the same variety, the large seed will have an approximate 10% better yield potential. While not expressly mentioned in the research, it is reasonable to assume that small seed will produce less fall forage as well. For more reading on this subject consult Kansas Agricultural Experiment Station, Keeping Up With Research numbers 74 (1984) and 101 (1991). We have established that larger seeds are better on a seed vs. seed basis; however, there are 36% more seeds in a bushel of wheat with 15,000 seeds per pound as compared to a bushel of wheat with 11,000 seeds per pound. So, when sowing by pounds per acre the additional seeds compensate for the smaller seed size and generally results in the same total number of tillers . This compensation effect means that planting by pounds per acre works for a wide range of seed sizes and varieties. This should not be taken as an excuse to plant poor quality seed, as the compensatory effect is not the same if you are sowing shriveled, light, or head-scab damaged seed. If you are sowing high-quality, large seed, then seeds per acre might be a better option. To get this type of seed usually requires a favorable environment during grain fill, adequate fertility, and a foliar fungicide in-season followed by an aggressive seed cleaning process. I have heard Phil Needham say, and I agree, that 10% seed cleanout is a minimum. Most seed lots require 20 – 40% cleanout to achieve large-seed status. Including a gravity table in the cleaning process will increase seed quality further. The fact of the matter is that most of our wheat seed in the Great Plains simply does not consistently fall into this category. For this reason, if you are sowing “average” quality seed by seeds per acre, then adjust your seeding rate up accordingly to ensure you are not short on tillers. Seeds per acre may also a better option if you are managing fertility to manipulate final tiller numbers. In this scenario, farmers will sow a set number of seeds per acre and adjust topdress rate and timing to encourage or discourage tillering to reach a desired number of heads at harvest. You can do the same thing when sowing by pounds per acre, but you will need an accurate stand count shortly after emergence. When used in combination with an accurate tiller count in February, a stand count will allow you to accurately estimate potential heads per acre and adjust accordingly. Finally, if seed costs rise significantly in the future, a switch to seeds per acre might be justified. No one would suggest planting a $300 bag of corn or cotton seed based on pounds per acre. I don’t know what the wheat seed cost threshold is for switching to seeds per acre but would assume that if we ever reach this point seed quality will increase accordingly, making seeds per acre a better option. As is usually the case in Oklahoma, we currently have a wide range of soil moisture conditions. Soils in central Oklahoma are generally dry on top, but there is ample soil moisture below. Soils in western Oklahoma and the Panhandle are dry all the way down. A few drills have started rolling, but most producers are waiting on a “State Fair” rain to get started (for all you non-Okies, it usually rains sometime during the State Fair in early September). While moisture availability is the primary driver of wheat planting, it is not the only consideration for producers. 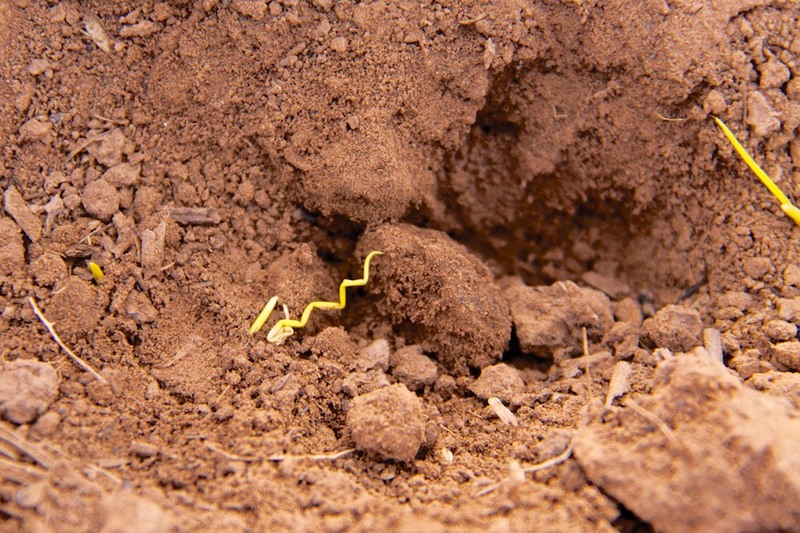 Hot soil conditions can affect wheat germination too, and there are a few questions producers should ask themselves prior to planting into soil temperatures >90F.